That’s the question that everyone asked me when I told them I was joining the Peace Corps in Burkina Faso. I had spent two years after college in Washington, D.C. working behind a desk for a great social impact organization, sipping coffee and feverishly typing on my computer. But I was itching to get out into the world and learn how change happens on the ground. I had previously studied abroad in Senegal, so when the Peace Corps assigned me to Burkina Faso in West Africa, I quickly said yes! As a Volunteer in Burkina Faso, I collaborated with farmers to build a sesame business so they could earn more by growing and selling better quality sesame for export. I helped them form a cooperative and build relationships with exporters. We collaborated to build and implement the tools they would need to run their businesses with limited literacy. While surrounded by this farming community, I began to think back to another agricultural product I love: coffee. Most coffee is grown by small-scale farmers like the ones I worked with in Burkina. I also began to think back to my days as a teenage barista and wished for a great cup of coffee to replace the instant coffee I was drinking every morning. Collaborating with these farmers made it very real to me how business could be a powerful tool to create a positive impact. My time in the Peace Corps shifted my path towards business school at the Ross School of Business at the University of Michigan (where President John F. Kennedy proposed the Peace Corps!). After business school, I worked in consulting for a few years. It was during my time in consulting that my father was diagnosed with cancer while I was on a stressful work project. The combination of work stress and worrying about my dad prevented me from sleeping, and my love of full-strength coffee was making it worse. The only thing I could change at the time was to give up my coffee... or, at least, caffeine. I quickly learned how challenging it was to find decaf coffee that I was excited to drink. Decaf drinkers are drinking coffee for the taste and the ritual, not the caffeine fix, so I believed that we deserved excellent tasting coffee, too! Last year, I started Savorista, a craft decaf company that focuses on caffeine-conscious coffee lovers. Rejecting the stigma placed by many in the coffee industry, Savorista is proud to prioritize decaf and we celebrate the incredible community of people who love coffee without the caffeine. 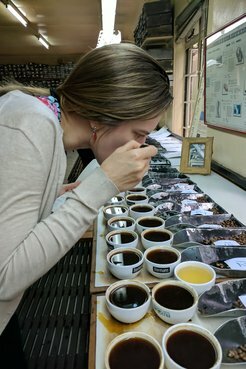 Harnessing what I learned in the Peace Corps – that there is no substitute for learning and building relationships in person – my fiance and I set out on a global decaf quest to learn about coffee, meet potential partners and look for decaf coffee that was worth savoring. In a blind taste test in Colombia, we fell in love with a coffee with great flavor. I loved it, but was sure it was caffeinated. At the reveal, I was pleasantly shocked to learn it was decaf. In that moment, I decided that this would be our first coffee and that we would only offer shockingly great decaf – coffee so flavorful that everyone is surprised to learn it's decaf. 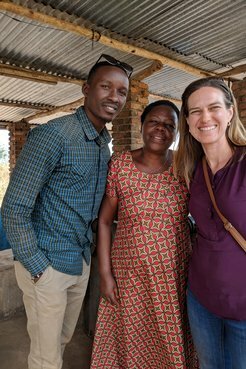 During our decaf quest, which also brought us to Kenya, Rwanda and Ethiopia, I continued to draw on my Peace Corps experience: focus on relationship building, learn the cultural context, be flexible and don’t give up. The Peace Corps enabled me to build my entrepreneurial muscles while working with the farmers and taught me about accomplishing things resourcefully. In Burkina Faso, I learned how to deal with ambiguity and move forward, even when the path isn’t completely clear. I draw on this every day as I navigate building a startup. For anyone considering the Peace Corps, the best way to gain perspective would be to speak with returned Volunteers to hear their stories and learn from their experiences. This would be the perfect opportunity to ask your burning questions about what to expect. The same approach works well for returned Volunteers who are reintegrating back to the U.S. Find others who have been in your shoes – they’d be more than happy to share their words of wisdom! Years ago, I spoke with many returned Volunteers before deciding to join the Peace Corps. When I completed my service, it was those conversations that convinced me that going to business school would be a good next step. I’m so happy I sought out returned Volunteers at these different times in my life. Otherwise, I definitely wouldn’t be on this path I love. 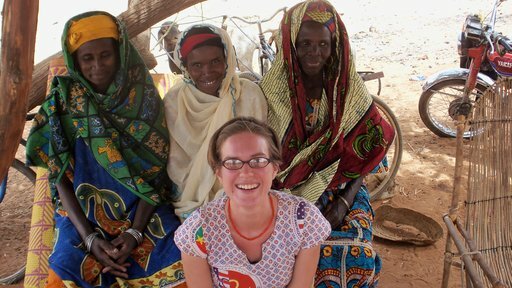 Kait Brown served as a Peace Corps Volunteer in Burkina Faso from 2008-10. Her Peace Corps experience taught her how business can create a positive impact in the world and eventually led her to start a craft decaf coffee company, Savorista.